The World Junior Ultimate Championships’ gold medal game in the Boys’ Division was a fit of stops and starts leading to what, in some ways, felt like an inevitable conclusion. Though both the weather and Team Canada would have intermittent success — a series of lightning delays, a Canadian lead at 7-6 in the first half — the inevitable would come to pass in both cases: the tournament was completed and the U.S. National Team captured a gold medal, defeating Canada 15-10. The weather did all it could to delay the end of the tournament but, if this summer’s WUCC finals were any indication, the World Flying Disc Federation will not let any weather conditions stand in the way of completing a tournament. The game began inconspicuously enough as the USA and Canada traded holds to 3-2. Notably, Seattle’s Connor Ryan caught the U.S.’s first two goals. He finished the game as the overall scoring leader with six goals, doubling the individual total of any other player from either side. At 3-2 Canada, which had been handling the junk defenses that the Americans had been using to disrupt initiating pull plays, gave the U.S. its first short field break opportunity on a mishandled disc by Ryan Eisbranner. The United States capitalized quickly by finding Ryan Dinger, who excelled defensively all tournament long for the USA, in the end zone to take a 4-2 lead. This left the Canadians heading straight into a wind that had proved nearly insurmountable in the girls’ final that took place on the showcase field just a few minutes earlier. The Americans were clearly revved up for the break opportunity but both teams surprised by gutting out holds while attacking the upwind end zone. A lengthy, multi-turnover point followed that pair of scores. The United States took a timeout in the Canadian red zone with a chance to end the point and complete the break, but they gave the disc back in the face of stifling Team Canada defense. Eisbrenner more than made up for his earlier mistake by soaring to catch a pass from Jeffery Boris that popped up, maintaining the one goal differential by making the score 5-4. That catch would prove crucial as, on the ensuing point, Canada stymied the U.S. with a four-person cup that forced a short field turnover and led to an inside break from James McLean to Aiden Hayter to get the game back on serve, 5-5. After the teams traded goals to get to 6-6, the weather changed from being a factor to being the story of the game. Rain poured down in sheets and the Americans struggled to put passes together to get out of their own end zone. After three turnovers, all in their own red zone, the Americans yielded a break, as Canada found an open upline cut to take a 7-6 lead. However, from that point on, the game became a clinic of American efficiency. The United States only turned the disc over twice in the next six points (both times on the same point, perhaps the rainiest of the game) while Canada struggled to maintain possession. With especially effective play coming from Dinger, both in getting blocks and gaining yardage after Canadian turnovers, the United States found themselves sitting on a 11-8 lead. Dinger, a team captain, continued to prove his worth on the 11-8 point by claiming two blocks in the deep space and helping control the disc during an especially sloppy point to give the U.S. a 12-8 lead that put their opposition deep into a hole. As if sensing the blood in the water, after a Canadian turnover, Dylan Villenueve sent a huck downfield to Connor Ryan, who reeled it in with an enormous layout to take a 13-8 lead. Canada managed a hold to bring the score to 13-9 before a lightning delay put another pause to play. By this time, both the fields and the players were soaked, and a particularly sloppy point followed. However, strong defense from the USA’s O-line kept the disc on the Canadian half of the field and eventually the United States’ Kodi Smart caught a goal to put the score at 14-9. What followed were perhaps the two cleanest and quickest points of the game, as Canada scored with a huck and the American offense responded with a Johnny Malks-led possession,1 sending a perfect flick to Ryan who, unsurprisingly, had beaten his defender to an open space in the end zone and scored the final goal for the USA. It was the second-straight gold medal for the USA U20 Boys, and they completed a USA sweep of the tournament for the first time since 2006 after the Girls won earlier in the day. 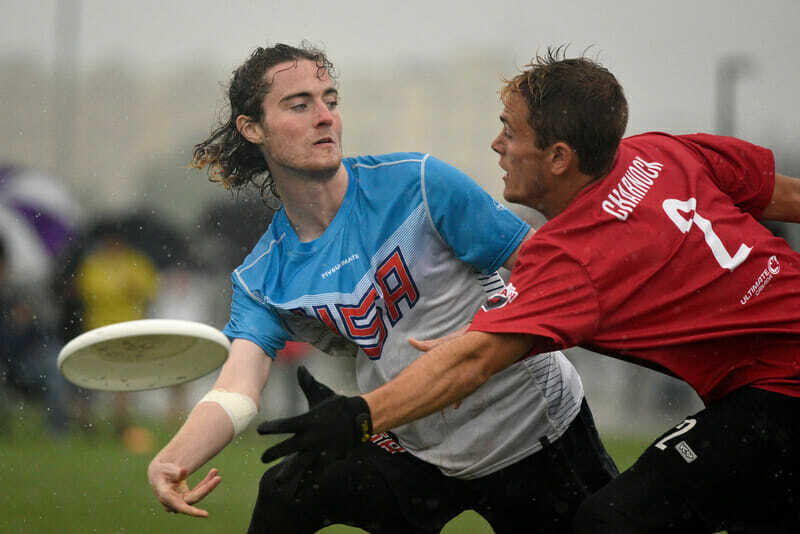 Comments on "WJUC 2018: USA U20 Boys Best Canada In Rainy Final"